When was the last time you had a look at all the apps in the Hootsuite app directory? There is an ever growing list of apps so every so often it’s worth checking them out. Most Hootsuite apps allow you to integrate with other applications that you might already use outside of Hootsuite. They save you time by not having to swop back and forth between the applications. Evernote is a great note taking application. If you come across any good tips, content, articles or anything else useful that you want to keep note of you can drop it in to Evernote. The Evernote Hootsuite app is also quite useful. 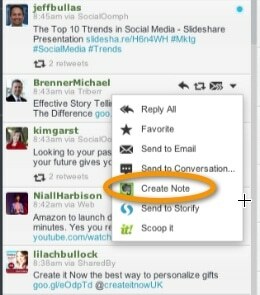 You can view the notes directly within Hootsuite but a more useful option is to add tweets to one of your notebooks in Evernote. If you see a tweet with some great information or a link to some great content select the arrow to the top right and then pick ‘create note’. This is a great way of keeping an ongoing list of content to share out on social media channels. Or just keep a note of great content you want to come back to at a later stage. Scoop.it is a content curation platform. You create some boards which are based on topics you are interested in and when you find good content you add it to a relevant board. You can follow other people that have boards so that some of your content curation is done for you! I have found that Scoop.it is useful for keeping track of good articles you come across but also it is a good source of regular traffic. But we have very limited time so opening up Scoop.it all the time may not be suitable. 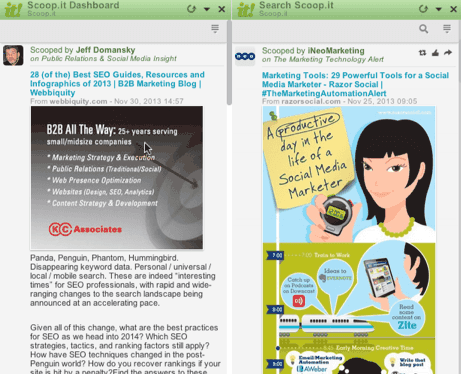 In Hootsuite you install the free Scoop.it application. Using this application you can view a stream of content from boards you follow (left hand side) and you can also search for content (right hand side, I searched for social media tools). The Scoop.it app also allows you to add content to Scoop.it directly within your Twitter feed. This is really handy because as soon as you come across an article you can copy it to Scoop.it without having to go near Scoop.it. Nimble is a pretty neat social relationships management tool which is designed to help you keep track of and build relationships with people relevant to your organization. Nimble is very tightly integrated with social media channels so within Nimble you can view all the social activity of any of your contacts. 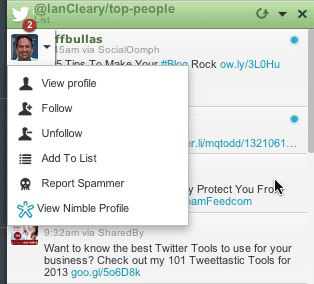 In Hootsuite when you have Nimble installed you can select any tweet and view the full profile of that person within Nimble. Select the picture of the person in Twitter and then the ‘view nimble profile’ option. If the person is not in Nimble and you think it’s worth keeping a track of the relationship with this person you can then add the person to Nimble. You’ll need to check out Nimble first to see if this is an application you should use. 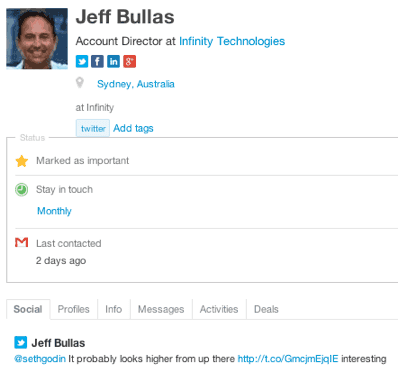 Hootsuite is great for day to day interaction but it’s not great at tracking relationships. Using Hootsuite with Nimble is a good combination. A good addition to this app would be the ability to add a stream to Hootsuite from Nimble. This is currently not supported. Trendspottr is an application I’ve been testing out for the last couple of weeks. There’s lots of applications that will report on historical data and show you what content was popular. 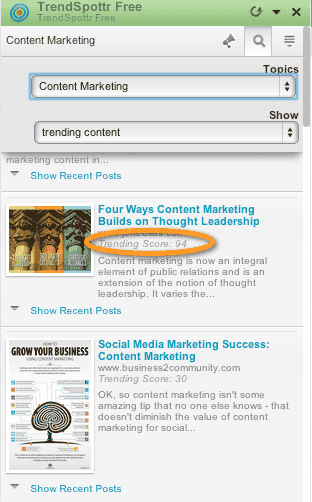 Trendspottr tries to work out when content is going to trend (you’d never guess from the name!!!). There is a free and a paid part to this plugin. When you install it you can view trends from predefined categories. If the category of content you are interested in is on this list you’re laughing! If not then you’ll need to pay for a subscription to view content directly relevant to what you are interested in. The following shows content Trendspottr thinks is going to trend related to content marketing. The category options you can select from is content marketing, technology, infographics, economy, sports, pop culture, politics, science and celebrity. The filters you can choose are trending content, hashtags our sources. In the image above we have highlighted the trending score. This is a score out of 100 and the higher the score the more likely it is to trend. Finding content that is going to trend means we get an insight scoop and can share out content that is going to be good news. It might also give us ideas for content that we could write before it does actually trend. Nice to get on that wave before it even comes! Storify is about creating a story built up using social media updates. The best example is at a conference. You compile a list of great tweets and photos related to the conference and create a story about them to share out to the world. When you install the Storify app in Hootsuite you have an option to add a tweet to a story in Storify. So it becomes a very quick way of building up a story. Hootsuite has over 75 apps already and this is growing. As the apps directory grows this gives you more reason to use Hootsuite as your central dashboard. 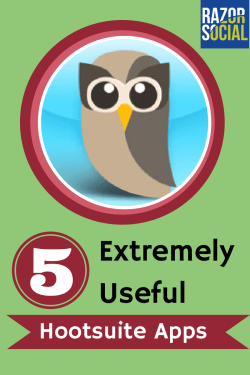 What apps do you use within Hootsuite? Which ones would you use from above?